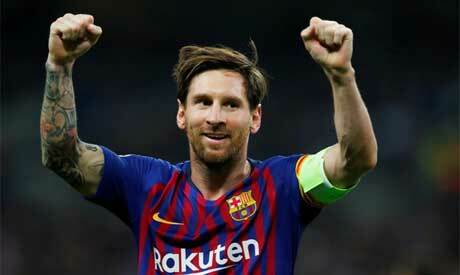 Lionel Messi's mesmeric display in Barcelona's 4-2 Champions League win over Tottenham Hotspur on Wednesday proved yet again that he is a class above the world's other top players, team mate Jordi Alba has said. Messi ran amok at Wembley Stadium, slicing Spurs apart with incisive passes from deep, such as the one that allowed Philippe Coutinho to open the scoring, and was as dangerous as ever in front of goal, firing in the Catalan side's final two goals to end their winless run of three games. "Messi eats at his own table, he plays on another level to the rest," Barca defender Alba told reporters. "When Leo goes on a run, all the rest of us can do is grit our teeth. He is the best in the world and he makes all of us a little bit better." Messi was a surprise absentee from the three nominees at FIFA's The Best awards ceremony last week in London, where Real Madrid's Luka Modric was crowned Player of the Year ahead of Mohamed Salah and Cristiano Ronaldo. "For me 'The Best' is a lie," said Alba. Rakitic, the scorer of Barca's second goal, said Messi was one of a kind. "With respect to the other players, Messi is unique," he added. "Sometimes a player has a great season like Modric did, but we all know Messi is different." "If we played like this every day then we'd win every competition every year," said Alba. "If we do things in the right way and work as a team it's very difficult to beat us. If we all fight for the same objective the results will come." "There are some games you look forward to a lot and this was one of those and we're very happy with how the players responded," added coach Ernesto Valverde, who had faced heavy criticism in the media in the build up to the game. "I hope the fans are too."